Five new ISO 7010 Safety Signs have been internationally published by the International Standardistation Organisation (ISO). The new signs are already available from Brady on high performance materials for optimal durability in a range of industrial contexts. 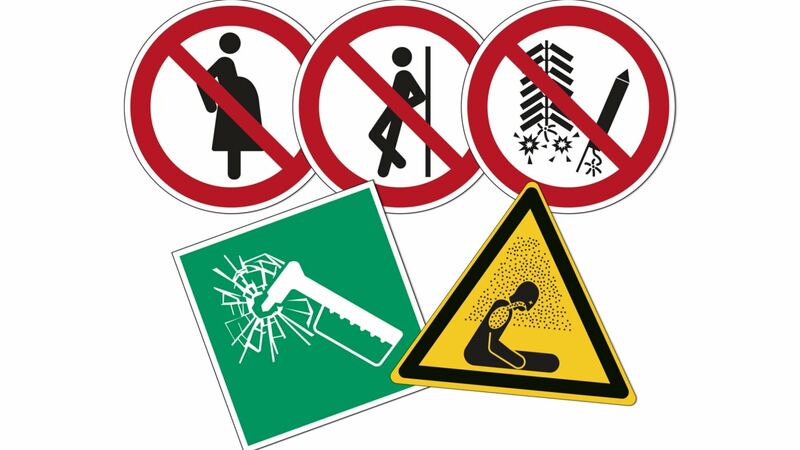 The new, expanded ISO 7010 list of internationally published safety signs now includes a standard sign for emergency hammers (E025), fireworks prohibition (P040), no leaning (P041), not for pregnant women (P042), and a warning sign for asphyxiating atmospheres (W041) in confined spaces. Brady Corporation closely monitors any ISO development and, as a result, already offers all ISO 7010 Safety Signs on high performance materials to optimise their durability in challenging industrial contexts, including indoor high heat, chemical and washdown facilities and outdoor and off-shore environments. Available high performance materials include laminated polyester, polypropylene, aluminium, vinyl, rigid vinyl and photoluminescent 'glow-in-the-dark' materials. Prevent costly accidents with safety signs. Download the free ISO 7010 safety sign guide!